Business hours: 10.00am to 10.00pm. ANOTHER Taiwanese brand has arrived in Malaysia and this time it brings locals a taste of the island’s dessert offerings and has lately introduced some new and unusual bread-based sweet endings. “Our new menu addition is the Honey Toast and Danish Toast. Both are generally the same except we used different type of breads for it,” said ZenQ Desserts Malaysia administrative and business development executive Karen Lim. She said the first has a base of a square slab of bread that they then hollow out. “The bread is carefully cut into nine pieces and removed to be buttered. The insides of the hollowed bread crust is also buttered before it is placed back inside so everything can be lightly baked,” she explained. Next, the top part is spread with a layer of custard cream before adding a scoop of ice cream and various toppings. 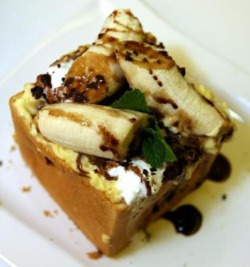 “We offer three flavours for Honey Toast: Cookies and Cream, Strawberry Lover and Chocolate Banana,” Lim added. 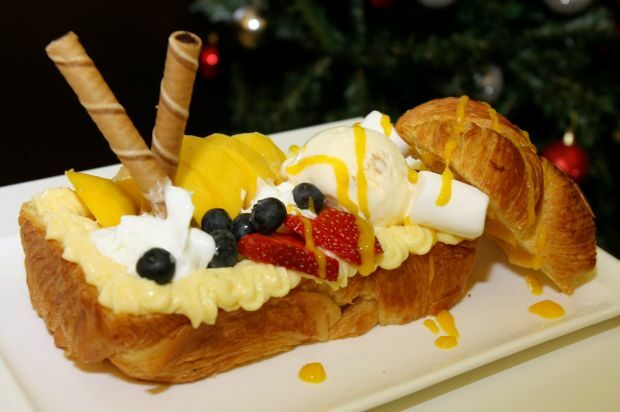 Sinfully sweet: Inside the Honey Toast,customers will fine nine sticks of bread, perfect tomop up the sauces and ice cream with. As for the Danish Toast, the bread used is a danish that is hollowed out with the top sliced off to create a boat shape. “People like the Danish Toast because it is crunchy on the outside. Again, the insides are buttered and baked before we add a layer of custard cream. Next, we put a scoop of ice cream and fresh fruits according to the flavour chosen,” she said. The available flavours for this are Blackforest, Mango and Blueberry while additional toppings that go on the dessert are marshmallows, whipped cream and love letters. Each of these desserts are quite large in size and is best shared between two to three people. According to marketing and communications manager Nicole Tan, there has been increased orders for the two desserts since it was introduced in the middle of December. Cooling: The Taro ZenQ Grass Jelly features the high quality grass jelly from Guan Xi, Taiwan, some Q Yuan that comes in taro, match a and sweet potato flavours as well as a scoop of ice cream. ZenQ Desserts is currently gaining popularity as a place to go to for snacks such as its Grass Jelly, Shaved Ice, Barley and Red Bean desserts. “We will be introducing the Snow Ice series in January in conjunction with the coming Chinese New Year and hot weather we will be facing,” she said. Tan also said that 10% of their sales proceeds from the month of December will go to a charity home Rumah Sayangan.